Using foil to lift, remove brownies from pan, and peel foil away. Cut into 27 triangles as follows: Cut 3 horizontal rows. Cut each row into 9 triangles so each triangle has a 2-inch wide base. (See diagram below in Tips.) Set aside end pieces for snacking. For each hat, squeeze white icing over lower third of brownie triangle for hat brim. Sprinkle candy sprinkles on hat’s brim. Pipe red icing on remaining unfrosted top of brownie for hat. Place 1 mini marshmallow at top of triangle for pom-pom. 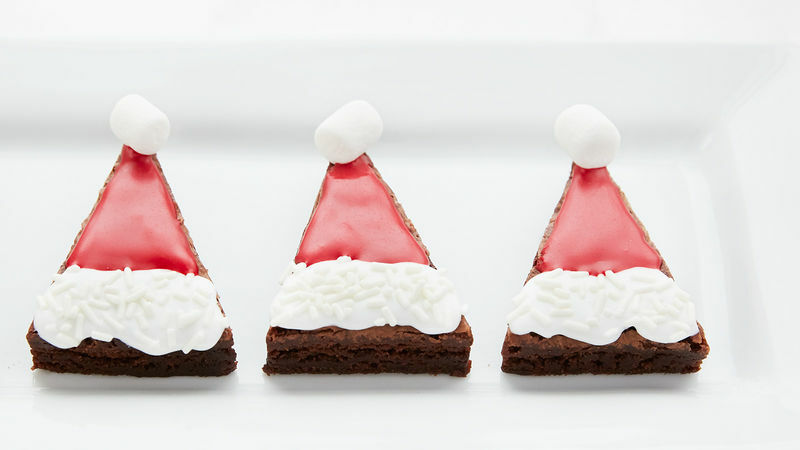 Use this template to get the maximum number of Santa Hats out of your brownie sheet. Be sure to decorate one brownie at a time, as icing tends to set quickly.